Melbourne builders will begin running the ruler over one of 2018's largest construction tenders. Activated last week, the tender is for the delivery of two residential towers across 85-93 Lorimer Street which combined have the potential to add 940 approved apartments to the skyline. The sizeable site behind Mirvac's Yarra's Edge spans 8,847 square meters and is adjacent to a new tram corridor that is currently being studied as part of the Fishermans Bend planning process. Alongside the hundreds of new apartments across both towers, the successful builder will also be required to deliver as many as 778 podium car spaces plus amenities. 53,454 square meters of approved Net Saleable Area is included under the approved Elenberg Fraser-designed scheme. Spanning 47 and 49 levels, it remains to be seen whether the $200 plus million construction tender will be true to the approved design, or will see design modifications implemented. 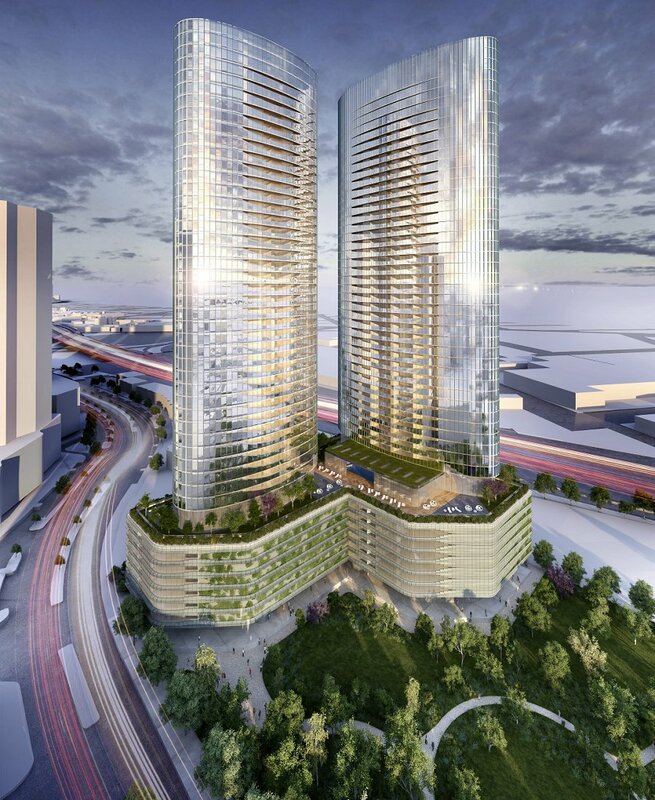 Known as South Wharf Towers to date, the launch to tender hints toward an imminent retail launch of one or both towers. Backed through planning by local developer Little Projects, the approved scheme was thereafter offloaded by the developer at the height of interest from Asian-based developers in the Melbourne property market. Selling agent Colliers made note during 2016 of a new Shanghai-based developer secured the development site for around $60 million. Whilst it now shapes as one of the city's larger apartment projects in waiting, the final outcome will also see a substantial 2,100 square metre public park created, accounting for approximately one-quarter of the site. 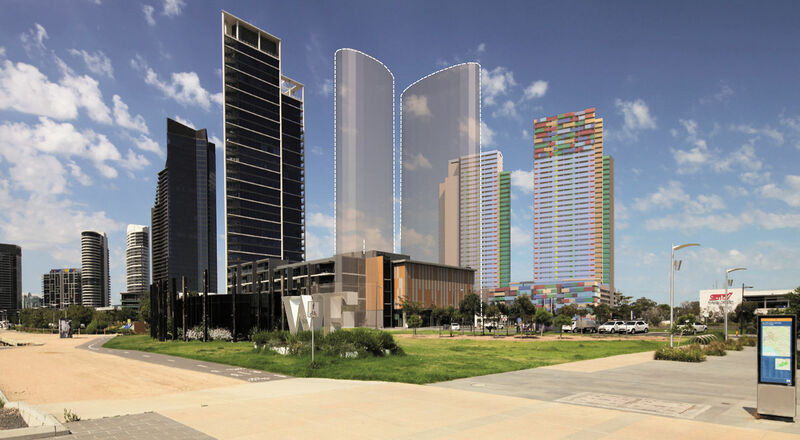 South Wharf Towers was initially submitted as a single 74 level apartment tower spanning 236 metres; at that height, it would have comfortably been Fishermans Bend's tallest building. Subsequent to negotiations with the State Government, the final result saw dual Elenberg Fraser-designed towers approved. At the time of its approval, Minister for Planning Richard Wynne stated "this development reflects our vision for the future of Fishermans Bend, offering open space and well-designed apartments close to transport and services. We encourage innovative developers to put forward projects which we can be proud of decades after construction."